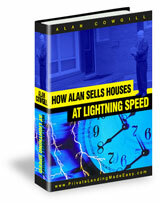 To Buying 5 Houses per Month"
"How Alan Sells Houses at Lightning Speed"
Did you know there are 30 steps to purchase a property? Well there are and Form #15 (Property Purchase Checklist) is that form. You should get this system just for that form alone. Miss one step in the 30 steps and you have just created CHAOS in your business. And chaos means waste. I.E. you lose money. Download Only! No Shipping Charges! 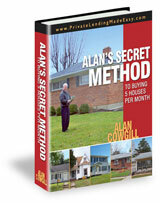 "Alan’s Secret Method to Buying 5 Houses per Month"
BONUS #1: Q&A with students. After he shows you all the items listed above, Alan takes it a step further and gives you a special question and answer bonus section in the eBook where he answer all his students’ questions. You don’t want to miss this extra bonus, so order it today. BONUS #2: Order now and immediately receive the eBook "Insights About Private Lending"
Look if you can’t sell that house NOW, you start losing some of your profit. It begins to evaporate with holding costs. After a while you wonder what went wrong… Maybe you’ve even scheduled to show the house to someone… You drive to the property, and then wait for thirty minutes all alone to finally realize that they’re never going to show up. Let me show you how to never go through this pain again. I’ve created a powerful 46-page eBook and two audios, with 80 minutes of detail and spectacular tips on how to sell houses at lightning speed.